"Introducing Our Exciting New High Quality, Information Packed Quilting Magazines Created Just For You - And Best Of All...One's FREE!" Select which Magazine version you want and click the subscription button. Type In Your REAL email address. Please use your REAL email that you check, otherwise you won't get your magazine! Check Your Email For Your First Issue! We'll start sending you the Online Quilt Magazine immediately. Our Favourite 67 Quick Tips for Quilters - a carefully researched selection of the most useful Hints and Tips we could find. A FREE Pattern! "At Home Among the Gum Trees" is one of the most downloaded wallhanging patterns from the Quilt Block of the Month Club.com, and we have their permission to share it with you Exclusively as a Special Bonus. Fill out the form below and you'll immediately receive your Subscription to the FREE Standard Online Quilt Magazine each and every month! There's NO COST, just 100% great Quilting Articles and Hints and Tips for you. Upgrade your Subscription and receive our Premium Online Quilt Magazine, with More than 50 pages of great Quilting Stories, Hints and Tips, How To's and Bonus Patterns for you each and every month. AND - Access to all previous Online Quilt Magazine issues in our archives! Start My Premium Subscription Right Now! We look forward to sharing these wonderful magazines with you. PS. 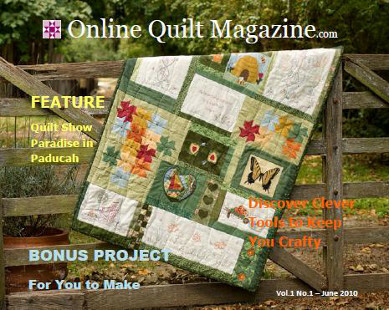 Register above to receive your new Free Standard monthly Online Quilt Magazine NOW. Or for only $10 for the Year, Upgrade your Subscription and Receive an issue each month of our Bigger Premium Monthly Magazine plus the Upgrade Bonuses (valued at more than $50). That's more than 50 pages of articles, tips and projects each month for less than $1 per issue!